Here at Jaunt we think one of two ways. ‘Only the best’ or ‘Only the most authentic.’ When we find something that marries the two together (and involves five-star culinary fare), we get hungry to share with the masses. Yes, Silversea is the best cruise line in the world and we say, “If it’s good enough for Isabella Rossellini, it’s good enough for the jauntiest of the jaunty.” Voted “World’s Best” by the readers of Condé Nast Traveler and Travel + Leisure, Silversea is offering a foodie lover’s wetdream (get it? ), a collection of the world’s most flavorful destinations expertly paired with the culinary world’s hottest talents. These moveable feasts are perfect for sophisticated travelers who enjoy high-end dining as much as the adventure of luxury travel. 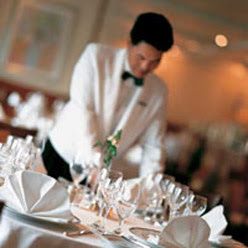 In case you’ve never hit the high seas aboard their ultra-luxury liners, Silversea Cruises is recognized as an innovator in the luxury segment, offering guests large-ship amenities in an intimate setting. The best part? 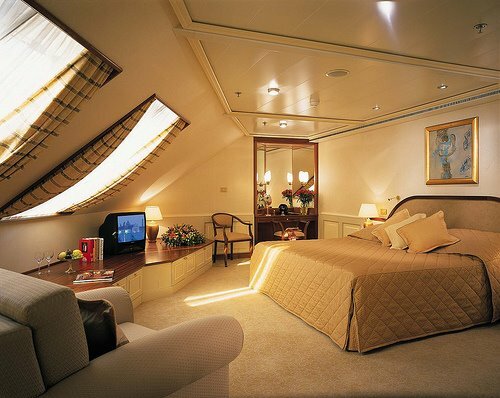 All-suite vessels! The Silver Cloud, Silver Wind, Silver Shadow, Silver Whisper, and recently launched in December, the Silver Spirit. With the addition of the regal expedition ship Prince Albert II, the company’s itineraries encompass all seven continents. The enlightening café lifestyle of Paris in the 1920s (immortalized in A Moveable Feast) stayed with American writer Ernest Hemingway throughout his life … wherever he traveled … and for Silversea guests, this year’s 11 Culinary Arts voyages promise similar opportunities for personally enriching experiences that will linger after the journey ends. 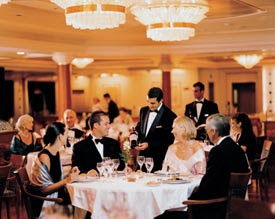 These unique culinary theme cruises showcase the artistry of award-winning chefs of top dining establishments from around the world, including the internationally acclaimed chefs of Relais & Châteaux, the exclusive collection of 480of the finest hotels and gourmet restaurants in 56 countries. Established in France in 1954, the family of hoteliers and Grands Chefs from all over the world share a passion for exceptional quality. From the vineyards in Napa valley to the beaches in Bali, from the olive trees in Provence to the lodges in South Africa, Relais & Châteaux offers a chance to explore the Route du Bonheur and discover a special place in a variety of destinations. On the culinary sailings, celebrity chefs will display their talents during dynamic and informative cooking demonstrations where guests can taste and learn firsthand the secrets of enticing signature dishes. Chefs include the likes of Rick Tramonto, partner and executive chef of Chicago’s Tru, a Mobil Four Star and AAA Five Diamond restaurant; Eyvind Hellstrøm, owner and chef of Michelin Two Star Bagatelle in Oslo; and Anne Desjardins, the chef/co-owner of CAA Four Diamond L’Eau à La Bouche in Ste-Adèle, Québec. The Culinary Arts enrichment voyages also feature escorted provisioning trips to international markets, food and wine pairings, creative regional dishes, and a five-course grand gourmet dinner. Throughout these special voyages, the featured guest chef and Silversea’s executive chef are on hand to share their culinary expertise and answer any questions. Below, with the handy help of Silversea’s excellent staff, we’ve put together a list of the Culinary Arts voyages around the world. Now hit the high seas and relish the good (foodie) life! Voyage 3912: Silver Shadow, May 28 – June 7, Seward to Vancouver, 10 days. Early Booking Incentive fares start at $7,050. Jonathan Lindenauer — Bon Appétit magazine’s chef de cuisine will be in residence to bring the Bon Appétit Supper Club to life and offer guests a taste of his signature recipes. This avant-garde concept of a stylish, limited-time dining experience will transform La Terrazza into a New York-inspired restaurant. 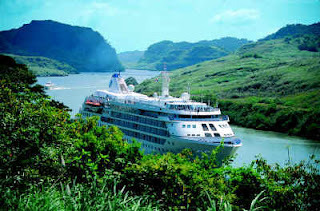 Voyage 3917: Silver Shadow, July 20 – August 1, San Francisco (roundtrip), 12 days. 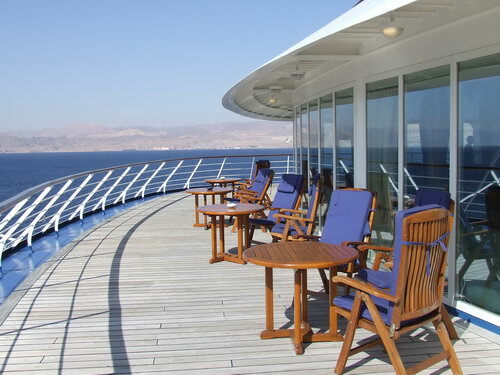 Silver Sailing fares start at $4,747. Gregory Short — Executive chef of Masas, San Francisco. Voyage 1926: Silver Cloud, October 19 – 29, New York to Barbados, 10 days. Silver Sailing fares start at $3,397. Relais & Châteaux Grand Chef Anne Desjardins — Co-owner of L’Eau à La Bouche Ste-Adèle, Québec, Canada. Voyage 3929: Silver Shadow, November 13 – 22, Barbados to Fort Lauderdale, 9 days. Silver Sailing fares start at $3,047. Relais & Châteaux Chef Stéphane Mazières — Executive chef of Le Gaïac restaurant at Hôtel Le Toiny, St. Bart’s. Voyage 3909: Silver Shadow, April 11 – 29, Sydney to Singapore, 18 days. Silver Sailing fares start at $10,496. Relais & Châteaux Chef Mathew Macartney — Executive chef of Chateau Yering, Melbourne, Victoria, Australia. Voyage 2915: Silver Wind, May 14 – 21, Barcelona to Nice, 7 days. Silver Sailing fares start at $3,197. Relais & Châteaux Grand Chef Rick Tramonto — Executive chef/partner of Tru, Chicago. Voyage 2922: Silver Wind, July 18 – 28, Monte Carlo (roundtrip), 10 days. Silver Sailing fares start at $6,177. Relais & Châteaux Chef Vincent Nattress — Executive chef of Meadowood Resort, St. Helena, California. Voyage 4931: Silver Whisper, October 3 – 10, Venice to Rome, 7 days. Silver Sailing fares start at $4,616. Lidia Bastianich — Author, TV chef and co-owner of Felidia and Becco restaurants, New York City. Voyage 2933: Silver Wind, October 18 – 30, Istanbul to Rome, 12 days. Silver Sailing fares start at $5,847. Anton Mosimann — Chef/owner of Mosimann’s, London. Voyage 1916: Silver Cloud, July 11 – 26, Copenhagen (roundtrip), 15 days. Early Booking Incentive fares start at $11,396. Relais & Châteaux Grand Chef Eyvind Hellstrøm — Chef/owner of Bagatelle, Oslo. Fares listed are per person based on double occupancy for a Vista Suite and do not include port charges and handling fees that range from $100 to $500 per person, depending on the itinerary. How sweet it is! 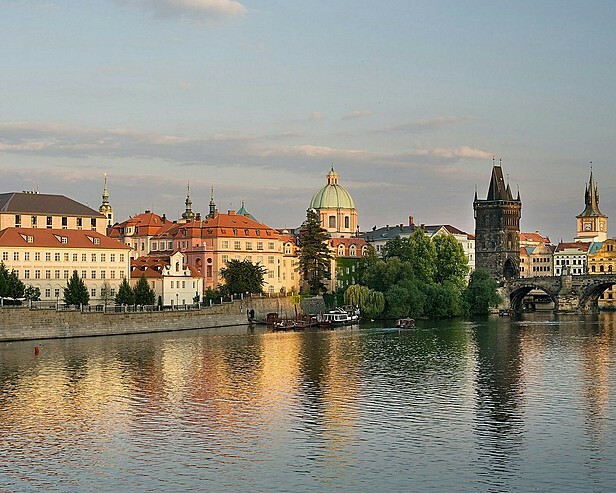 The buzz in the kitchen at Four Seasons Hotel Prague is starting to spread. In addition to the 27 (yes, 27!) talented cooks at Allegro, the Hotel’s Michelin-star Italian restaurant, there’s a rumour that 9.6 million specialty “chefs” have been recruited to make the food even sweeter. But these chefs don’t chop, sauté or bake. In fact, they’re bees — literally! — property of Allegro’s longtime saucier, Vladimir Milfait. Go Vlad. We love a unique twist on luxury. During prime honey-producing months, he maintains 60 hives, each of them occupying up to 160,000 bees, because that’s what it takes to make the 500 kg that’ll keep the restaurant dripping in deliciously sweet honey for about a year. Why so much liquid gold? 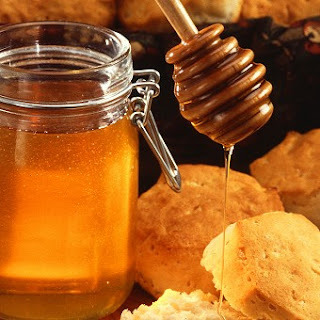 Well, from pastries to meat marinades and sauces, honey is a key ingredient on the menu. What makes this stuff so special is variety: Vladimir’s workforce creates oak, pine, and linden tree honey, all of which differ in scent, colour and consistency. This allows the restaurant’s other chefs — vastly outnumbered by their bee counterparts — to select the right flavour for the right dish. Talk about a sweet retreat for you and your honey. The World’s #1 Destination Spa. 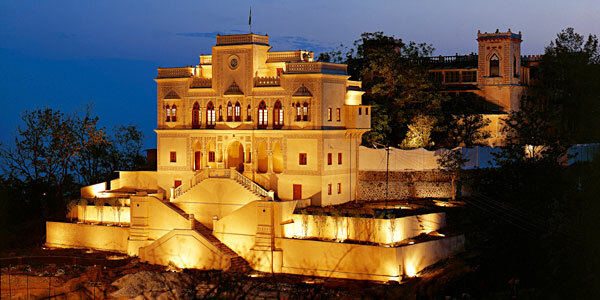 Ah, so much can be said about a spa at the base of the Himalayas that was once a stunning princely estate ruled by the Shah family. The previous residence of Maharaja of Tehri-Garhwal is now ranked by Conde Nast as the World’s Best Destination Spa and known, far and wide, to be charged with an all powerful “Shakti” energy. Legend has it that the holy Ganga, which flows through this sacred city, has actually been sanctified by the trinity of Hindu mythology (Brahma, Vishnu and Shiva) and, in the days of the British Raj, the palace welcomed noble Viceroys and people of eminence – including, you guessed it, Mahatama Gandhi! Located in the tranquil Himalayan foothills close to the mythological cities of Haridwar and Rishikesh, Ananda is the spiritual pathway to the ultimate, discovered through the union of body, mind and soul. 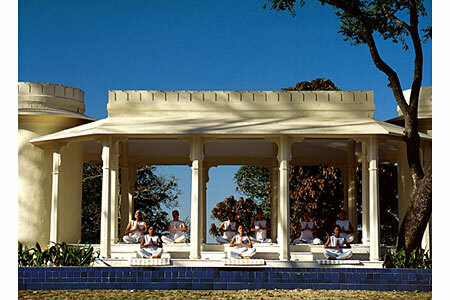 As their website says, “It is not just a retreat that will leave you breathless with the enchantment of its surroundings, but it will assist in redefining your lifestyle.” Garhwal today remains a land of myth and legend, where every stone tells a story. The earliest historical references to the region are found in the Vedas, paeans to the purity of the Himalayas. Specific mention of the mountains also exist in the Mahabharata, dated around 1000 BC. 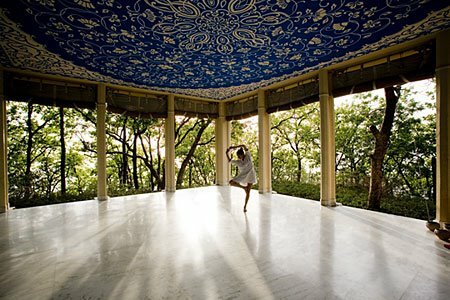 So take all that great Indian history and a spa program grounded in Ayurveda, Yoga and Vedanta combined with contemporary international therapies and world class masters and Ananda is truly the ultimate exotic holistic escape. Hot off the streets of Taipei, Jaunt Contributor and Guest Blogger, Sarah Breidenbach, takes us on an inside tour of Asia’s post-Chinese New Year bliss. It’s been a long time since I’ve written about life ‘n things in Taipei. Life in Taipei was a rough adjustment after the luxurious US lifestyle tour I took in ’08, but I’ve managed to fall newly, and madly, in love with the place. A friend who has lived here for a long time recently told me that it takes coming back to Taipei several times before you start to understand it. It’s true. 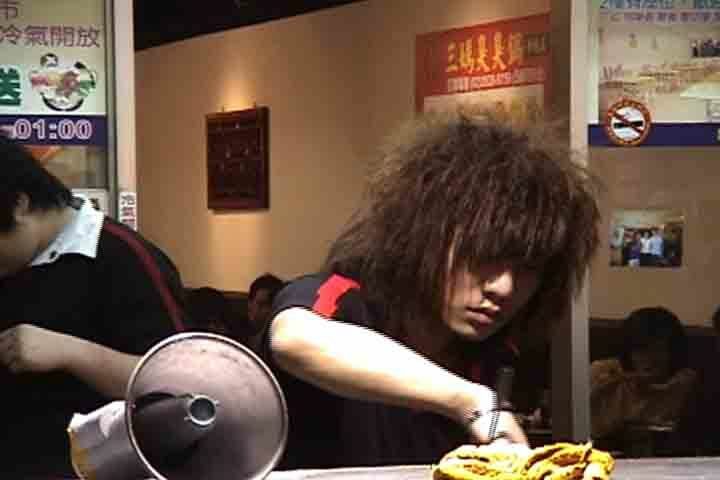 Taipei does not present beauty up front. It doesn’t it hand it to you sweetly and easily. But after enough time, you start to dig the jewels out of the rough. The beauty seeps through cracks and shines forth in your direction. That’s certainly been my experience lately. We’ve just completed the Chinese New Year which always happens in February. Last year I was in Thailand because, well, that’s what everyone seems to do when the whole island shuts down and goes on vacation. But this year I stayed home and enjoyed the fruits of our urban monster’s slumber. 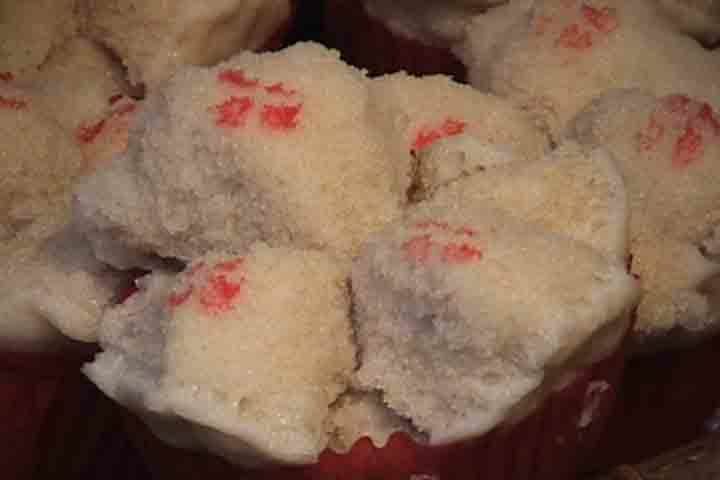 I ate steamed rice flour cakes. I watched hoards of fireworks from the terrace and stepped through the red dusted streets the next morning. The tradition is to let off fireworks that leave a red powder everywhere. The smoke, noise, and lights scare off demons and clear away bad energy so that the year begins with the fresh dew of your heart’s desires and clean visions of your mind’s determination. 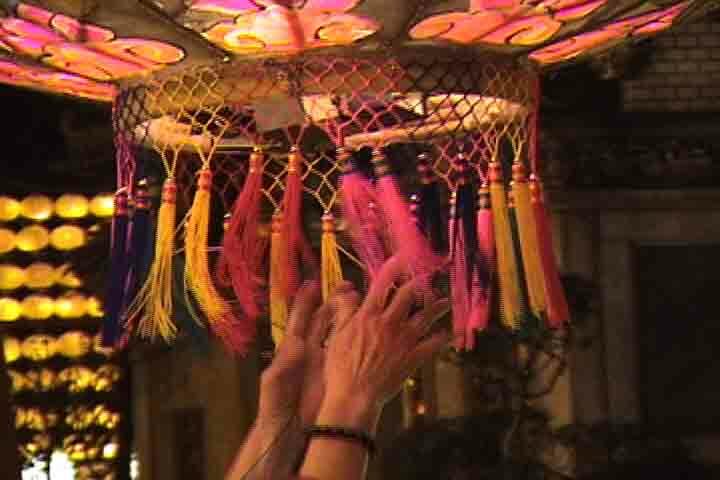 This all takes place on dark/new moon followed by the lantern festival on the following full moon. OH… the moon this year! It was magnificent! So bold, golden, and pregnant with possibility. During my free time, I went on hikes and visited various hot springs. There are hot springs in every direction from Taipei. South of here, there is an area called Wulai where there is a river, small town, and beautiful quiet Japanese style bathhouses that serve yummy ginger tea. There are also many hotsprings to the north that are easily accessible by the subway. 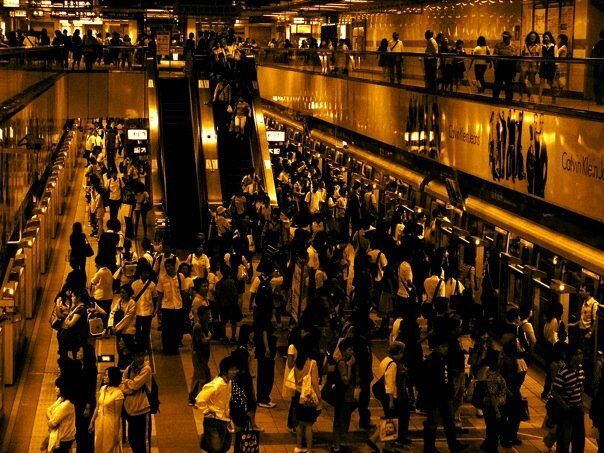 Beitou is about a 45-minute trip from my home. Most of the hot springs are sulfur based but there are all different kinds including one that sources iron ores from under ground that make the water a beautiful black/burnt orange. At one such hot spring that was quite old, simple, and traditional, I was met with a group of older women in their 60s who spoke no English. This place is known for being cheap and having “good soup” (direct translation from Chinese) which means ‘the water is white and cloudy.’ Full of tasty therapeutic minerals. The ladies were fascinated with me and couldn’t stop staring with curiosity. They helped me bathe before getting in the water. The handled my arms and moved me around. They seemed to know each other like they were regulars coming to soak every night. They then began asking me questions, few of which I understood due to my poor Chinese but we managed to communicate. This coming from women who look like 40 at age 60. They shared their age after much probing from me. I learned early on that it’s better to say “not yet” over any other lengthy explanation of possible values. This got them all giggling and plotting which son they might marry me off to. I then noticed the smell coming from one lady’s exfoliate/all body scrub. “Is that coffee?” I asked. She answered by handing me the jar of coffee grounds and helping to put some in my hand. Now, I’ve heard of coffee enemas but I’ve never tried scrubbing my skin with it. I loved it. And I marveled at the whole experience because it felt like the first time I had ever had that sort of kind cultural exchange one might hope for in traveling abroad. What can I say? 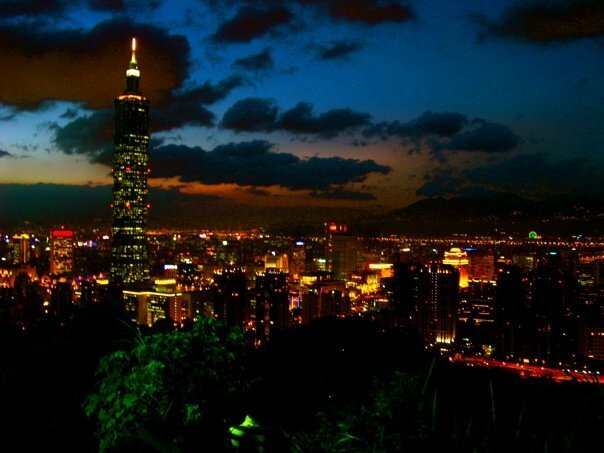 Taipei had been unique in its initial harshness. Like…stripper boots in the middle of the afternoon after a day of shopping at the mall. Like, dogs sitting at the table at restaurants. Like the woman who clears chicken bones from the table top after people have eaten up a storm. Like, weird unidentifiable meats at the market just near my house. And much, much more. 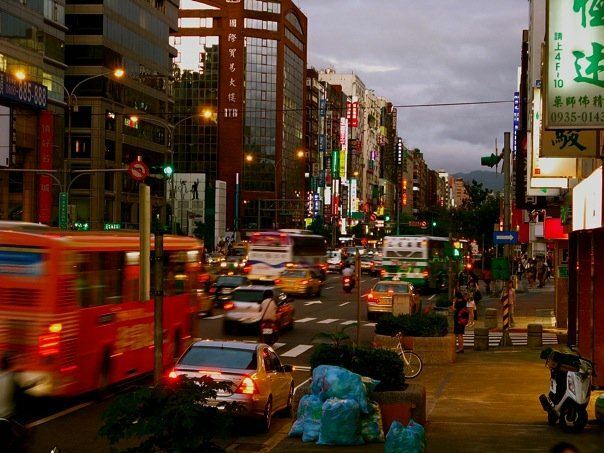 It’s Taipei and it’s downright charming. If you really want to see a display of Taiwan eating habits, you can have a seat at the Sogo (Shopping Mall) food court. Today I watched a kid place his mouth at the table’s edge while shoveling rice into his mouth with chopsticks. I watched a variety of mothers yelling (in whiney pitches) at children. And of course, I watched the innumerable small sized peeps consuming enormous quantities of food with a fervor that might lead you to believe they had been starving for months. I’m presently nauseous after eating six very fried round octopus balls. I’m a sucker for that crispy on the outside, soft in the inside combination, but the creamy sweet, dare I say, herbed up mayo content with chunks of chewy pus was something I ‘loved up’ once in a night market, but much less so on this day. For some reason I chose to follow that up with an oyster omelet which consists of small gray slimy guys wrapped in an egg & glutenous rice flour batter that stretches and pulls as you attempt to break up the pile with your chopsticks. Eating these items in a fluorescent lit mall’s basement food court so crowded with people that you often sit 3-4 strangers per table, is enough to make a girl feel light headed. Funny enough, I used to find this sort of thing slightly painful and overwhelming, but now it makes me smile. I find it comforting and familiar. Nevertheless, I think today will mark my quota for such dining since these particular foods are better eaten while taking in the fresh air of a night market. Now I sit in the “gay village” waiting to meet my screenplay writing partner to hammer out character developments on a new story. There is a hooka to my right, sitar playing through the speakers and a rose milk tea in my hand. In the distance there is the low humming of dizzying techno beats, cocktail glasses clinking and gay boys giggling. I could be anywhere in the world right now. The only give away was the initial subway arrival when I stepped out to a sea of young people, massive movie screen billboards and what looked like the activities of a large ant colony. There they were being good capitalists on a Sunday evening. Their shining black beetle heads busy taking away well packaged and purchased consumer goods for the queen. The other giveaway was the sweet scene I witnessed on my way here. I live on the “brown line” of the subway. It also happens to be the only subway line that goes to the Taipei Zoo. Last stop on the line. On weekends this usually means the cars are packed with families. Today, I watched a sleepy mother and daughter who had passed out on a bench, heads collapsed on each other’s shoulders, the little girl clutching a stuffed panda bear with a bamboo stem in its hand. They had probably spent most of the day waiting in an endless line to see the newly purchased panda bears from China. The Taipei zoo has limited the number of daily visitors to 2 million – this reported to me by one of my 8th grade students. I think he must be mistaking his number vocabulary but then again, maybe I’ve just become accustomed to living so densely. I mean there is a monitor in the subway station letting you know how many people have seen the pandas. I suppose I could do the math. But for now I’ll just sway, like a willow tree among the masses. The details don’t really matter as much as the quirky bits that make up any given day. Documentary filmmaker, artist, and social activist, Sarah Breidenbach graduated from Lewis & Clark College in Portland, Oregon where she earned a B.A. in Sociology and Cultural Anthropology. During the course of her stellar life and studies, she has lived and worked all over the world including: Ireland, Israel, Argentina, Zimbabwe, Mexico, and currently, Taiwan. 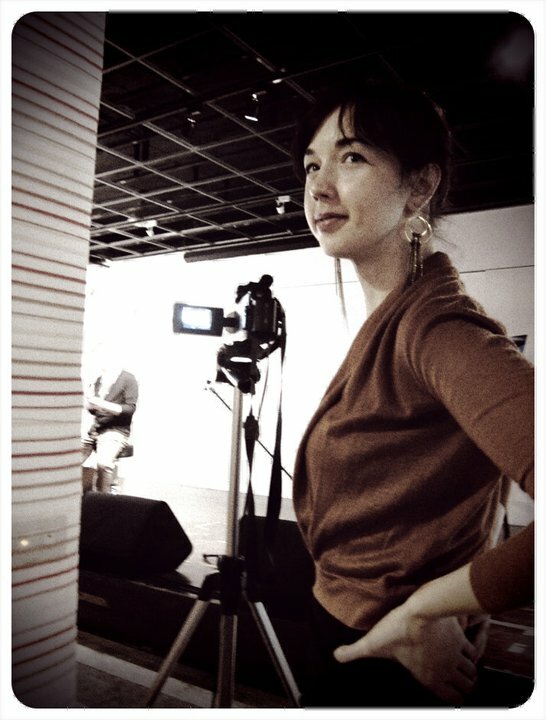 Sarah has produced, directed, and edited two documentary shorts entitled “With These Ten Fingers” and “Machismo Mata”. While we applaud her amazing talent and works, Breidenbach carries on, creating a global community of like-minded people seeking to build a new world through art in action. 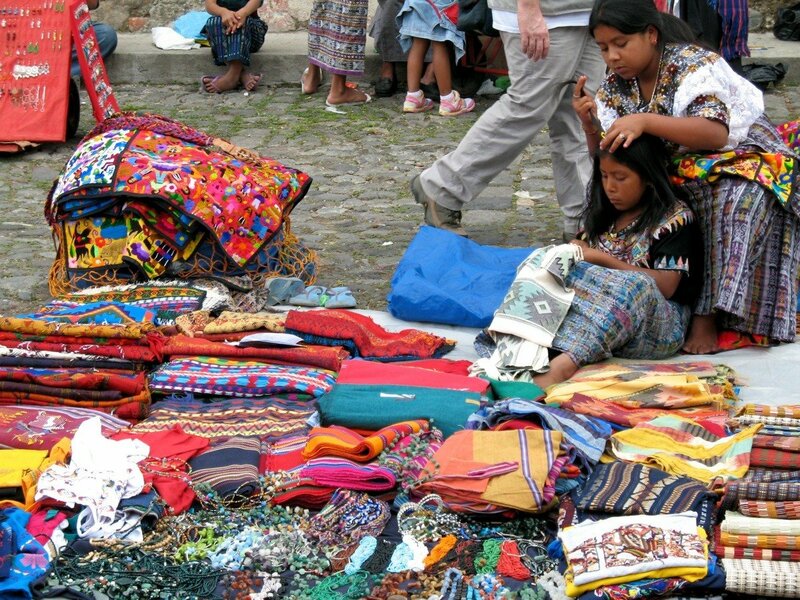 Every Jauntophile knows… Guatemala is one of Latin America’s hidden gems. Sandwiched between Mexico and Belize in the north and El Salvador and Honduras in the south, the name itself means ‘Land of Trees,’ and this hot jungle country is every bit as green as it’s name suggests. Poised somewhere between the old and the new, roughing it or Ritzing it, this Central American country combines the unique traditions of Mayan heritage with a urban landscape of bustling cities and lush resorts. Wildly beautiful with towering volcanoes, verdant rainforest, colonial architecture and fascinating beaches, fusing these elements together are the people, the majority descendants of the ancient Mayan. Warm and generous, their spirit is one of welcome. This Central American country is also one of the most indigenous in the world, now distanced from it’s unstable 36-year civil war. The best part? In this down economy, you can still get an entire meal for $3.00! This photo contains a piece of deer meat, Tepezquintle meat (this would be a noctural rodent highly prized for it’s rich flavor), a piece of wild turkey, and… a piece of Armadillo! 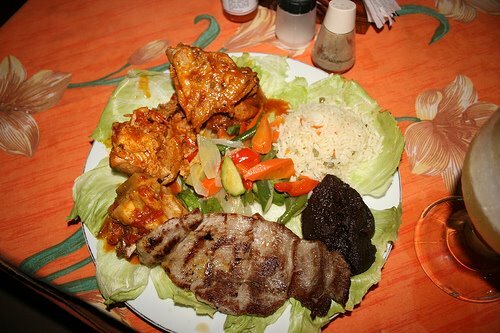 Don’t worry, not all the food is this daunting. So where to stay in this wild jungle paradise of woven ponchos and beaded bracelets? Below are a few places to rest your weary head, a homebase from which to take off and land. Ideally located in Guatemala City and Antigua, each hotel below is a destination unto itself, ideal for couples, business travelers, and families. Guatemala is the country’s cultural, political and economic capital. Founded on the site of the ancient Mayan city Kaminaljuyu, the city is renowned for its abundance of archeological sites and rich cultural history. Now with a population of more than 3 million, it is one of Latin America ’s most vibrant urban destinations. Hotel Vista Real, a member of Preferred Hotels® & Resorts, is the city’s grande dame. Perched above the city in an exclusive residential enclave, the Hotel Vista Real welcomes guests into an oasis of service and style. This all-suite luxury hotel stands out for its elegant artwork and fine dining. Comprised of 123 suites and eight meeting rooms, the Hotel Vista Real is ideal for a weekend getaway or dazzling wedding. Hotel Princess, a member of Sterling Hotels™, combines a great location in the bustling zona viva with a friendly staff for a reasonable price. 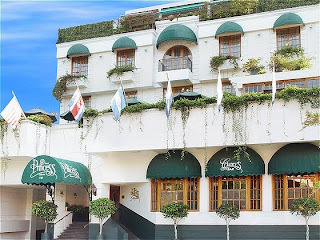 Just off of one of the city’s main avenues, Hotel Princess’s 104 guest rooms encircle an inner courtyard that is a haven for business and leisure travelers. The perennially popular Garden Court restaurant and Clancy’s Bar are the perfect places to sample great food and local hospitality. An hour from Guatemala City lies the captivating town of Antigua. Situated in the central highlands, La Antigua Guatemala (“The Old Guatemala”) was the country’s third capital and is a UNESCO World Heritage Site. In addition, if you’re looking for a beach close to La Antigua Guatemala, a few hours away is the beach of Monterrico where chickens and pigs roam free. In fact, we’ve even heard they like to dip in the ocean. Talk about au natural. A range of backpacker pensions and 3 star hotels are also available, if you’re interested in staying the night. 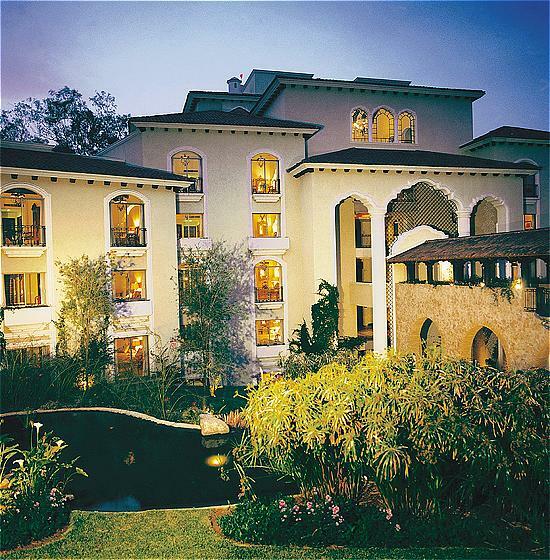 La Reunion, Antigua Golf Resort, a member of Preferred Boutique™, is the region’s most exquisite hideaway. A sophisticated collection of 26 free-standing cottages, each with their own plunge pool, every suite has been tastefully appointed in colonial style. Nestled amid two volcanoes, La Reunion also offers golf on a memorable Pete Dye-designed course. Gourmet cuisine and numerous activities make La Reunion, Antigua Golf Resort the great destination for a complete couples getaway. 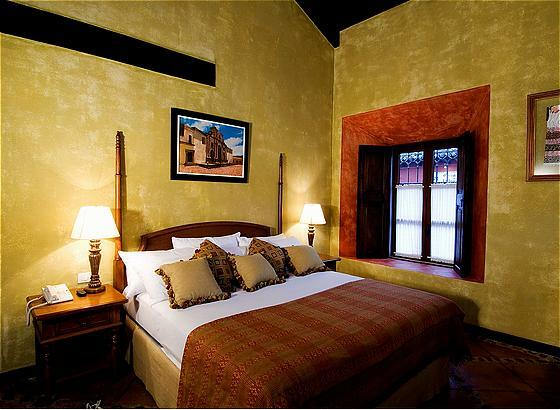 Porta Hotel Antigua, a member of Summit Hotels & Resorts™, is located in the heart of the city, an easy distance to explore Antigua’s cobblestone streets, colonial churches and monuments. With 115 guestrooms, the hotel is a lush oasis of soothing greenery. Encircled by trees, the pool area is a popular destination for cooling off after a busy morning of sightseeing or meetings. Before you start booking your tickets, growing a beard, and thinking you can singlehandedly unite The Americas into one (a la our favorite renegade revolutionary, Che G.), don’t forget to visit Lake Atitlan. 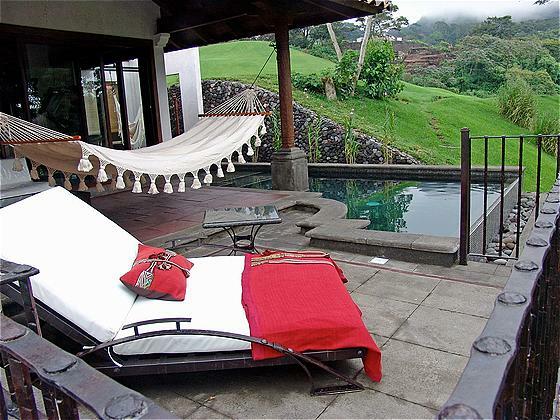 Lake Atitlan is one of the country’s most prized scenic locations. The tourist friendly fishing town of Panajachel is a great place to take an eco-tour of the area or climb the Pacaya volcano for a glance inside its cone. We also hear that a bus about five kilometers away from Antigua to Pastores is a village known for handmade leather Cowboy Boots. 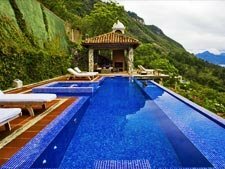 We think Casa Palopo is one fine spot overlooking Lake Atitlan, set against a backdrop of three volcanoes, Tolimán, Atitlán and San Pedro.